Apple on Tuesday issued an update for its all-in-one iMac desktop, bringing Intel's latest-generation Haswell processors, speedy 802.11ac Wi-Fi, and Nvidia's new GeForce 700 series graphics. 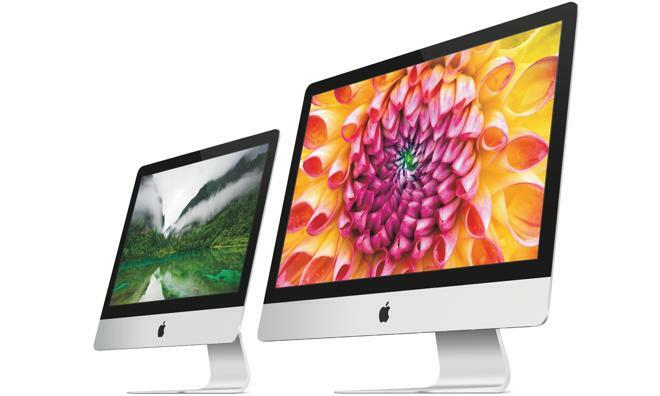 The new iMac also sports faster PCIe flash storage options to boost performance. It comes in the same thin design debuted by the company last year. "iMac continues to be the example that proves how beautiful, fast and fun a desktop computer can be," said Philip Schiller, Apples senior vice president of Worldwide Marketing. "Inside its ultra-thin aluminum enclosure, the new iMac has the latest Intel processors, faster graphics, next generation 802.11ac Wi-Fi and faster PCIe flash storage." The entry-level 21.5-inch iMac features a 2.7-gigahertz quad-core Intel Core i5 processor and new Iris Pro integrated graphics. It starts at $1,299. The high-end 21.5-inch model and both 27-inch models feature quad-core Intel Core i5 processors up to 3.4 gigahertz and Nvidia GeForce 700 series graphics with twice the video memory and up to 40 percent faster performance than the previous generation. 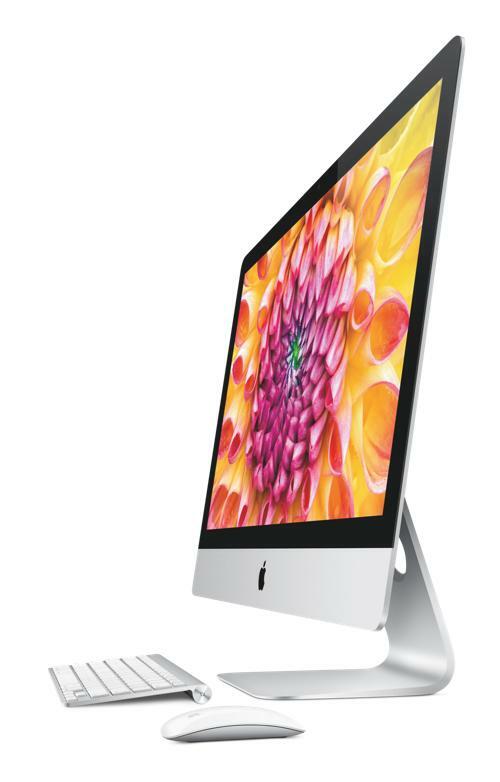 Apple's new top-of-the-line iMac is a quad-core Intel Core i7 processors up to 3.5 GHz and Nvidia GeForce GTX 780M series graphics with up to 4 gigabytes of video memory. It starts at $1,999. The updated iMac also supports next-generation 802.11ac Wi-Fi. When connected to an 802.11ac base station, iMac delivers wireless connectivity up to three times faster than the previous generation 802.11n. Apple's new iMac also features support for PCIe-based flash storage that makes Fusion Drive and all-flash storage options up to 50 percent faster than the previous generation. Fusion Drive option combines the large storage capacity of a hard drive with the high performance of flash to deliver shorter boot times and faster access to apps and files. Customers can configure their iMac with a 1-terabyte or 3-terabyte Fusion Drive, and all-flash storage options are now available in configurations up to 1 terabyte. iMac comes standard with 8 gigabytes of memory and a 1-terabyte hard drive, and customers can choose to configure their iMac with up to 32 gigabytes of memory and up to a 3-terabyte hard drive. iMac also comes with two Thunderbolt and four USB 3.0 ports for connecting to external storage and other high performance peripherals. 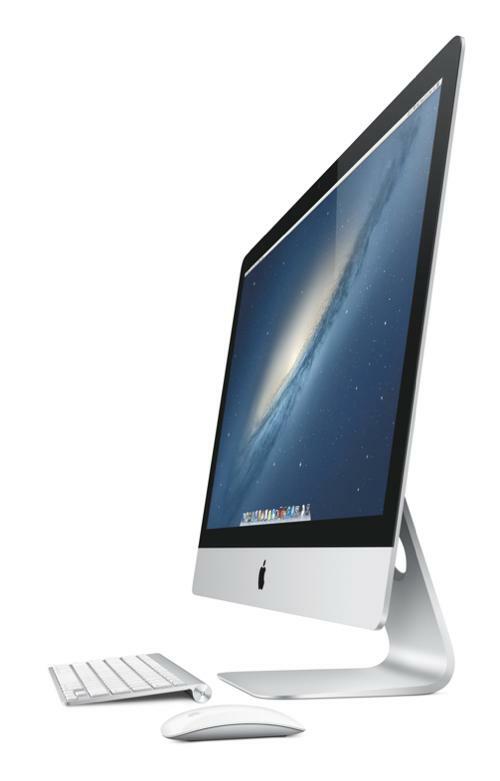 iMac also meets Energy Star 5.2 requirements and achieves an EPEAT Gold rating. The desktop features LED-backlit displays that are mercury-free and made with arsenic-free glass. iMac includes PVC-free components and cables, contains no brominated flame retardants, and uses highly recyclable materials and material-efficient packaging designs. iMac ships with OS X Mountain Lion, bringing Messages, Notification Center, system-wide Sharing, AirPlay Mirroring, Dictation, Game Center and Gatekeeper security. The new iMac is available today through the Apple Online Store, Apples retail stores and select Apple Authorized Resellers. The 21.5-inch iMac is available with a 2.7 GHz quad-core Intel Core i5 with Turbo Boost speeds up to 3.2 GHz and Intel Iris Pro for a suggested retail price of $1,299 (US); and with a 2.9 GHz quad-core Intel Core i5 with Turbo Boost speeds up to 3.6 GHz and NVIDIA GeForce GT 750M for a suggested retail price of $1,499 (US). The 27-inch iMac is available with a 3.2 GHz quad-core Intel Core i5 with Turbo Boost speeds up to 3.6 GHz and NVIDIA GeForce GTX 755M for a suggested retail price of $1,799 (US); and with a 3.4 GHz quad-core Intel Core i5 with Turbo Boost speeds up to 3.8 GHz and NVIDIA GeForce GTX 775M for a suggested retail price of $1,999 (US). 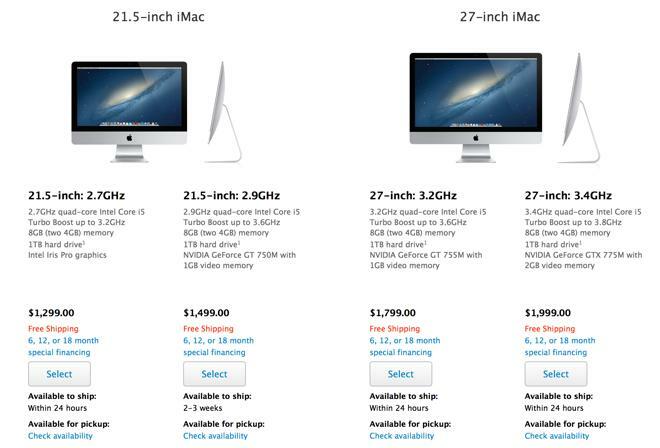 Additional technical specifications, configure-to-order options and accessories are available online at apple.com/imac. Readers who use links in the AppleInsider Mac Price Guide (iMac snippet below) can then manually apply coupon code APPLEINSIDER01 on MacMall's iMac product pages to instantly save an additional 3%, yielding the lowest prices anywhere. Additionally, MacMall only charges sales taxes in California, Illinois, New York, Tennessee, Minnesota, Georgia, North Carolina, and Wisconsin. Internet orders for Apple's newly updated iMacs will be processed by MacMall in the order they are received, and the reseller currently indicates that they will be able to start shipping 3 of the 5 models on Wednesday (tomorrow). We'll continue to update the Mac Price Guide with additional models and retailers throughout the week as the units begin to show up in their inventory systems.